If you were wondering whether the city's coalition of conservative business groups was open to supporting the Chargers’ plan for a new convadium in East Village, wonder no longer. Leaders of the hotel and visitor industry are now overtly advocating against it. Republican City Councilman Chris Cate and longtime activist April Boling have emerged as the leading voices against the Chargers’ plan. The Lincoln Club, a conservative political group, just launched a new committee supporting Republican City Council candidate Ray Ellis for the seat representing La Jolla and Carmel Valley. Its name is unambiguous: "Neighborhoods. Not Stadiums. A Political Action Committee in Support of Ray Ellis for Council 2016." On Tuesday, San Diego Mayor Kevin Faulconer met with die-hard Chargers fans who are leading volunteer efforts to pass the team’s stadium plan. At one point, BoltMan, the ubiquitous fan symbol, asked the mayor if he would pose in front of the group’s banner, touting the citizens’ initiative the team is circulating. The mayor refused. He told them he needed more time before supporting the measure. Jason Riggs, who runs the San Diego Stadium Coalition, was at the meeting. He said he and his counterparts kept trying to get the mayor to explain exactly what his remaining concerns were and what his timeline was for a decision. “It felt like a lot of foot-dragging. It was a lot of non-specific answers. It felt like talking to a politician,” Riggs said. And yet it’s the nicest reception the plan seems to be getting in the halls of power. If you were wondering whether the city’s coalition of conservative business groups was open to supporting the Chargers’ plan for a new convadium in East Village, wonder no longer: It looks like a decision has been made to crush it. And Ellis himself just dropped a case against the stadium. The day after the mayor hosted fans in his office, the Downtown Partnership and the Chamber of Commerce put on a forum featuring representatives of the hotel and visitor industry. 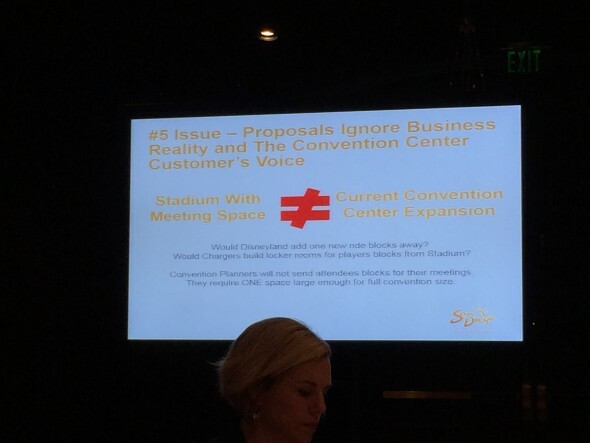 Mike McDowell, director of the Lodging Industry Association, a major coalition of hotels, panned the measure, saying convention groups did not want what the Chargers were proposing (that’s via Brady Phelps, a sports blogger, who recorded some of the discussion.) Joe Terzi, the head of the Tourism Authority, went further. The Chargers’ plan is just not something industry leaders wanted. “The fact is, if you build what is proposed by the Chargers, or another facility, it is not an expansion of the existing center. It will not satisfy the needs of those people, those larger conventions that are with us, want to stay with us and want to come,” he said at the forum. “We believe that you can sell another convention facility if we don’t get the expansion but you better build something that works. What is being proposed right now does not work,” Terzi said. John Kratzer, the CEO of JMI Realty, which runs the Omni Hotel and developed the Ballpark Village, said he would support the Chargers plan. The argument, he said, that it was not an expansion of the current Convention Center was a red herring. We don’t necessarily need just a larger building. You don’t build a church large enough to handle the crowds for a day like Easter Sunday. You build for what’s likely to come. And he said hotel owners should get used to the idea that the hotel tax is going to go up. They should decide what they’re going to get out of it now. “It’s inevitable. The (hotel-room tax) is going to get raised here. So why don’t we make sure that, in the process of that, we solve a bunch of problems,” he said. Kratzer, though, is a lone voice. The Lincoln Club, which previously clashed with the Chargers, dropped $100,000 on the new independent expenditure in support of Ellis in the San Diego City Council District 1 race. That’s not surprising. The club already had money in a separate political action committee supporting Ellis. What was surprising was the name of the committee, “Neighborhoods. Not Stadiums.” The Lincoln Club, a staunch ally of Faulconer, would not hammer a stadium effort if the mayor wanted to see it succeed. What’s more, it signals that the voter environment in District 1 is so hostile to stadium plans, the candidates have entered into a kind of spiral of contempt about who is more against public funding for a stadium. Barbara Bry, Ellis’ Democratic rival, after all, is opposed to the Chargers initiative too. Brian Pepin, the Lincoln Club’s executive director, told me that the money would highlight Bry’s support of the separate Citizens’ Plan, put together by activist attorney Cory Briggs, former City Councilwoman Donna Frye and JMI Realty. The Citizens’ Plan doesn’t allow for public money to fund a Chargers stadium but it does provide a route to funding a convention center facility that could support a stadium. That’s enough of a connection, apparently, to form the basis of thousands of mailers to come. “Barbara Bry supports a plan that provides a backdoor subsidy for a new stadium while claiming to oppose public funding. It is deceptive,” Pepin said. Bry said she would oppose a stadium that was not free of public subsidy, and Briggs said he offered to educate Ellis on what his plan does and doesn’t do. Ellis sent a letter declining the invitation. Regardless, the forces that have always been at Faulconer’s back are clearly organizing against a downtown stadium. Riggs said it was time for him and other Chargers fans to look for another candidate for mayor. “I really do encourage those who feel passionate about this issue to look at hotels backing the mayor and the corporations behind them and consider whether or not you want to stay at those hotels. Our group is taking a more aggressive position about these groups opposing the plan. They’re on notice,” he said.